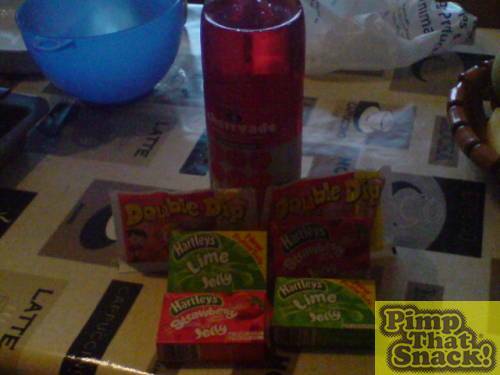 Reasons for pimping: Heck we were so bored we hadn't a clue what to do so we thought lets go down the shop and get some sugary things! We saw the pimp called the fizzy cherry and thought it looked easy so we set out to make that. 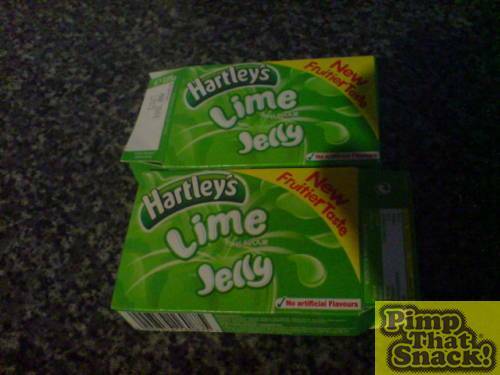 We started with 2 packs of lime jelly, 2 packs of strawberry jelly, some cherryade (as we couldn't find cherry jelly) and some sherberts. Firstly we put 2 packs of strawberry jelly together and instead of water we used cherryade to make it taste of cherry (a bit). We only followed the instructions of one pack of jelly and only just realised we only used half the amount of liquid when pouring it in so quickly added tonnes of cherryade. It seemed to be ok and took about 4 hours to set. 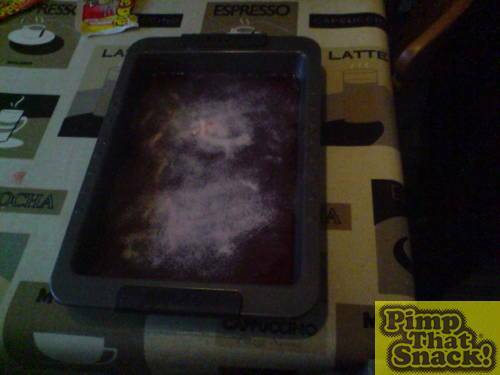 We got a bit bored in that time, so once again so decided to check out some other pimps to cook up once that had set. We went out to try and find something that would make a perfect circle, which took a long time. After a lot of discussion we finnally decided on pushing a cup into the jelly, and then hoping it would work, it did it fairly well. 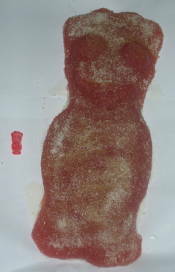 We tried to get rid of some excess jelly, but messed up the circle doing it. 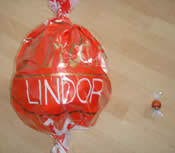 We did it because we had been getting rid of it by eating it, but then felt rather sick. So we decided to slant it a bit and scoop it out but whilst doing this the circles went with it and broke. This didnt put us in the best mood. We went on and tried to make the best we could of the circle so that we could continue the pimp and go on with the lime jelly. But not for long! 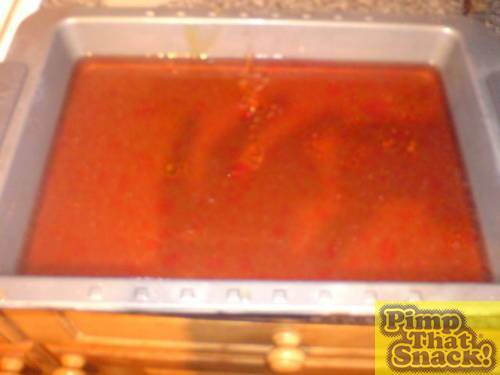 We hadn't realised that�cold set cherry jelly + scalding hot liquid lime jelly = Complete mess and no nice round jelly circles. 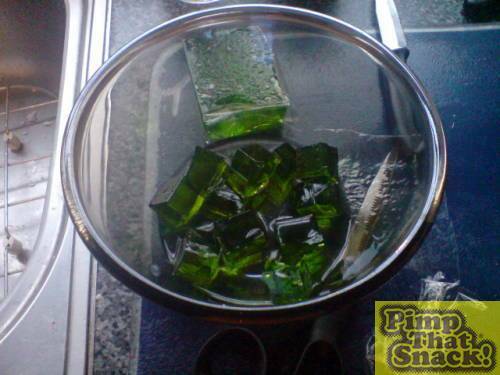 This basically sent us despair - we thought heck, it cant go much worse so we saw all the left over ingreadients (hot lime jelly, sherbert) and decided to add them all together and make a nice mixture. And oh was it nice. The sherbert and cheeryade had sort of mixed and made the jelly really fizzy! We had just made a pimp of our own: Pimp My Snack, Jelly time! !